The theme of the European Association for International Education’s (EAIE) most recent Forum magazine is ‘The New International Officer’. It includes a range of great articles about the challenges for higher education international officers now and in the future, and the attributes, knowledge and skills that professionals in this area of work need. 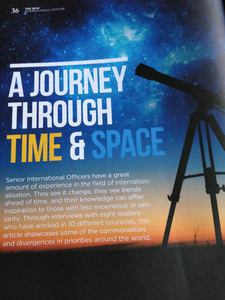 I contributed an article to the magazine, entitled ‘A Journey Through Time and Space’, which looks at changes in the international officer role over time in a range of different national settings. Having taken up my very first international office role (in a small Welsh university) in 1994, I am fascinated by the way expectations have changed within my own national context (the UK) over the course of my career. So I thought it would be interesting to speak to Senior International Officers (Director / Head of International / Pro Vice-Chancellor / VP International level) from a range of different countries about the changing nature of the international officer role - and their predictions for the future. I engaged with eight Senior International Officers working in varied institutional settings. Between them, they had held international relations roles in ten different countries (France, Morocco, New Zealand, Poland, Slovenia, Spain, Sweden, Switzerland, UK and USA). Many common themes emerged (such as a universal sense of professionalisation within the field), as well as some variations linked to national context. These experienced practitioners also offered some helpful advice for ambitious individuals at an earlier stage in their international office career. Here’s a pdf version of my article (along with the contents page and editorial of the Winter 2016 Forum magazine - see final two pages of pdf for my article). The rest of the magazine can be downloaded by EAIE members from the Association’s website.